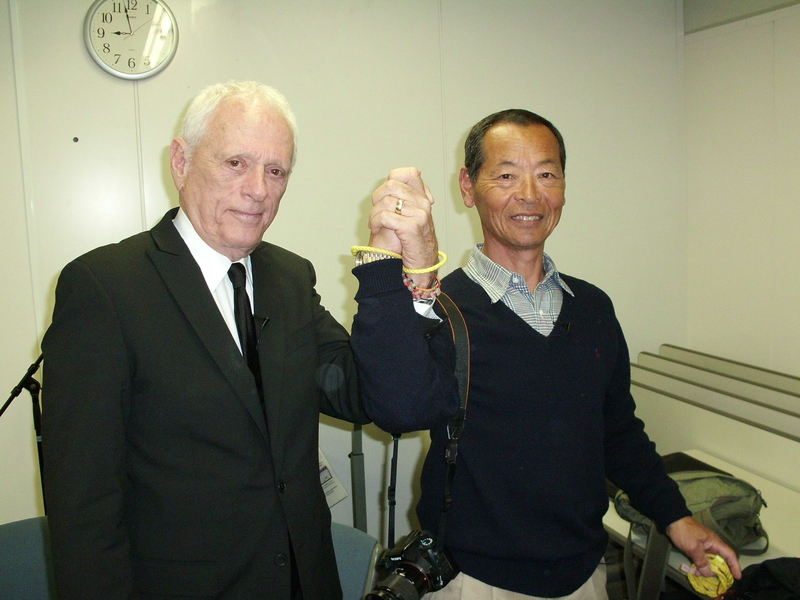 Dolphin activist and former Flipper trainer Ric O’Barry joined hands with his former rival, ex-dolphin hunter Izumi Ishii, as both disputed the government’s stance that drive hunting is a national cultural practice spanning hundreds of years. Ishii stressed that his mentors in Futo, Shizuoka Prefecture, taught the Taiji fishermen how to conduct dolphin drives in 1969. He said he believes this was the first time such drive fisheries were conducted in Japan. Ishii said his early efforts to capture dolphins, using methods to amplify sounds underwater to cause panic aimed at controlling the dolphins, are currently administered in a similar manner in dolphin hunts carried out in Taiji, Wakayama Prefecture. Taiji dolphin hunters currently capture dolphin pods by inserting long, metal poles with bell-shaped ends into the water and banging on them to create a wall of sound underwater, causing the dolphins to panic. They are then encircled by the fishermen’s boats and herded into a nearby cove to await their fate. O’Barry is world renowned as a dedicated dolphin defender and has released scores of captured dolphins worldwide. 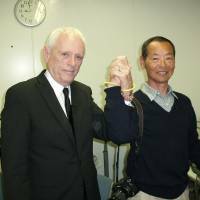 He was featured in the 2010 Academy Award-winning documentary “The Cove,” which highlighted Taiji’s yearly dolphin slaughter. Last Friday, he teamed up with Ishii in a joint presentation to a group of Japanese and foreign residents at Temple University’s Azuma Hall in Tokyo. Ishii said he had been hunting and killing dolphins for decades, but he later became conflicted about the massive slaughtering aspect of the drive hunts. He characterized dolphins as highly intelligent mammals that offered no resistance when captured and refused to bite him even while he was cutting their throats. Ishii said he became compassionate about the dolphins’ desperate plight in Japan. He also said unruly protesters railing over the drives in Taiji would only exacerbate the problem. Ishii believes he can persuade the government to stop submitting quotas for slaughtering dolphins in the annual drive hunts. He said he will solicit a massive signature campaign and submit the results to the Fisheries Agency in a bid to stop the annual slaughter. He added that if enough Japanese and foreign residents cite their disapproval, the government will have to re-evaluate its policy of promoting continuation of the drive hunts. O’Barry and Ishii also discussed the issue of mercury in seafood, agreeing that the government should require warning labels on all small cetacean food products sold in Japan. Recently, U.S. Ambassador to Japan Caroline Kennedy voiced her disapproval of the dolphin drives and stressed that the U.S. government condemns the dolphin hunts and is concerned about the health issues surrounding the high mercury levels found in small cetacean food products sold for human consumption. Dr. David Permutter, a famous Florida neurologist, told The Japan Times that eating dolphin meat is analogous to feeding consumers arsenic. Ishii said he regrets having killed dolphins and is currently conducting eco-tours in Shizuoka, offering tourists the sights and sounds of dolphins swimming in the wild.